In mid-July, our CEO Daman Wandke had the opportunity to travel to Las Vegas, Nevada for the annual US Business Leadership Network (USBLN) Conference. Daman booked a flight with United for him and his Personal Care Assistant (PCA), and he knew they were staying at the Cosmopolitan once they arrived; he was ready to go. After Daman arrived in Las Vegas, he waited 40 minutes for an accessible cab in 110-degree weather. There were other cabs, just not any accessible to him. This is not okay; if a company is going to provide a service one person, that company should provide the same service – including the quality of that said service – to all people. There should be more accessible taxis readily available so that people with disabilities are not forced to wait for transportation while others, who arrive later, are accommodated ahead of them. Once Daman arrived at his hotel, he naturally checked out the accessibility of his surroundings. As so many people with disabilities understand, not all places – including hotels – are completely accessible. However, Daman was excited to report that the Cosmopolitan was accessible. HIs room was extremely accessible as it was very large with a living room area. His room also had two beds which accommodated both Daman and his PCA; this is still not common as many hotels only provide accessible rooms that only have one bed. This room was made accessible to Daman as it had a well-designed roll-in shower. There was even a Jacuzzi tub that had grab bars. Even the deck, that was accessible, was equipped with outdoor furniture. The conference area was accessible as well. The bathroom door was always propped open which provided access to anyone who cannot open doors. As a part of the conference, Daman had the opportunity to network with six different companies– five showed up, one did not. As a startup, and for any business for that matter, networking is one key part of success. Daman built his network by making past connections stronger and introducing himself as well as AbiliTrek to others that he has never met before. In the conference room, there was a whole picture of the Chicago skyline displayed across the wall. Within this painting, there was one building that stood out to Daman–the Access Living building. 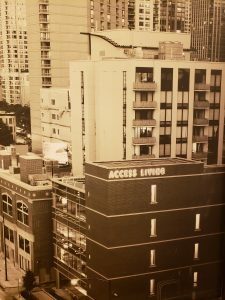 Access Living is a company based out of Chicago that provides the tools necessary to eliminate the barriers placed by society so people with disabilities have access to living life autonomously within their communities. How appropriate to feature a company located in Chicago that advocates for people with disabilities at a conference all about disability within the United States’ business sector. 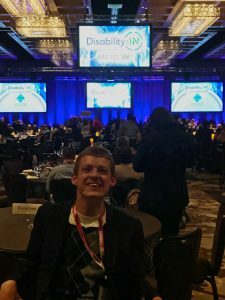 USBLN has officially changed its name to Disability:IN. The name change was revealed at this year’s conference. 126 businesses were also recognized for making it on the 2018 DEI list. This conference is all about improving access for people within the business sector and how disability is in. Daman smiling, sitting in his wheelchair in the conference area of the cosmopolitan with a crowd of people in the background along with four slide projector screens, three of the screens are the same size and are distributed across the furthest wall from Damon and are hanging in front of a blue curtain; the fourth is larger and hanging above the room. Daman and others with disabilities were extremely appreciative of the access at the Cosmopolitan. However, for many people with disabilities, access extends beyond their own personal needs; access includes being able to care for their service/working animals. The dog relief area at the Cosmopolitan was accessible but not well-designed; the ground was covered in Astroturf which absorbs heat and in the 110° weather, this became a safety hazard for dogs. It is beneficial to have a designated relief area for dogs but the design should be well thought through especially when located in a place with extreme temperatures. On the way to the airport with a 12:15 p.m. pickup time, a cab driver pulled up to Daman waiting at the curb. The cab driver was late and was shocked that Damon was still waiting for a cab. The cab driver had assumed that Damon was the person she was supposed to pick up simply because he was in a wheelchair; she did not ask for his name or reservation to confirm the pickup time. Once Daman realized he had been picked up by someone else’s cab, it was too late. Daman hopes that the other person who was supposed to be picked up had already gotten a ride. United understood that Daman would not have enough time to make his layover flight in San Francisco when his first flight in Las Vegas was delayed; they rebooked him to a nonstop flight home on Alaska. How nice to only have one flight home and not make it home much later than expected! Recently, plastic straws have been all the rage. With the banning of plastic straws in multiple cities as well as talk from different companies beginning to ban plastic straws as well, Alaska Airlines has proposed banning plastic straws as well. Ironically, mini plastic cups are all flight attendants are supposed to pour beverages served on the plane into and then passengers like Daman can pour the beverage into their own reusable cup. This is sanitary but wasteful. If Alaska desires to ban plastic straws to save the environment then they also need to figure out how to utilize reusable cups without wasting a plastic cup in the process. When Daman returned home, he had the nice surprise of having his wheelchair arrive unbroken and unscathed. He did not have to claim damages and was able to be on his way after exiting the plane. Coming home to a broken wheelchair can put a damper on the end of a trip; no one wants to come home to a broken anything and when it is a mobility device, that can be extremely hindering. Nevertheless, coming home to an unscathed chair was like a cherry on top to Daman’s Disability:IN experience.